I wish that you have the patience to read my thoughts because I’ve been told by many people that these ideas are the artwork itself. Migration, as one aspect of Transition / Rebirth, remains as a historical subject that is synonymous with renaissance and one of the main influences on spreading ideas of change from one region to another. 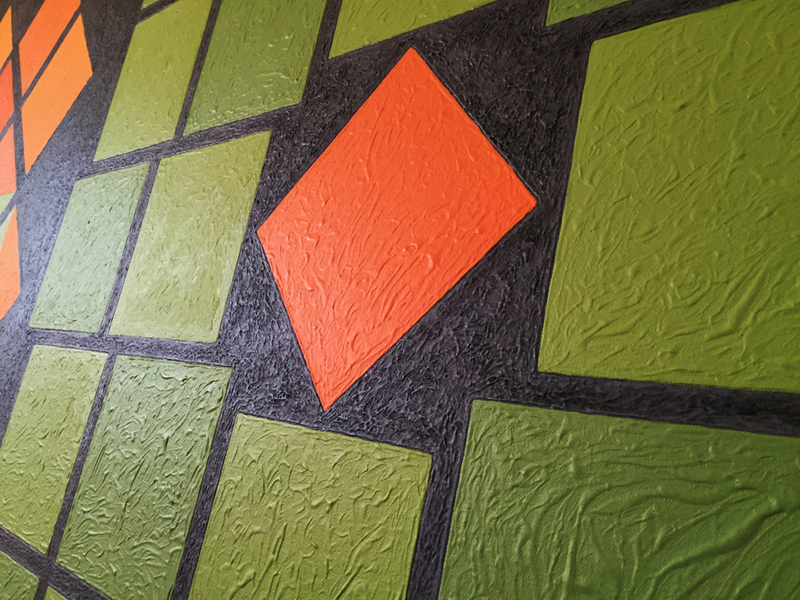 This art work is about two communities of squares and diamonds .The green square is migrating to the diamond community and the orange diamond is doing the opposite, symbolizing positive and negative behaviors of migration. The square is behaving positively by being flexible, it’s tilting its position to fit in the diamond community (adaptability) and also by sacrificing part of itself, leaving small slices of triangles as a way of communication with the new community which will have the choice to reassemble those triangles to take the shapes of squares, diamonds or even bigger triangles that will fill the gap between the two communities (cultural outreach between nations). 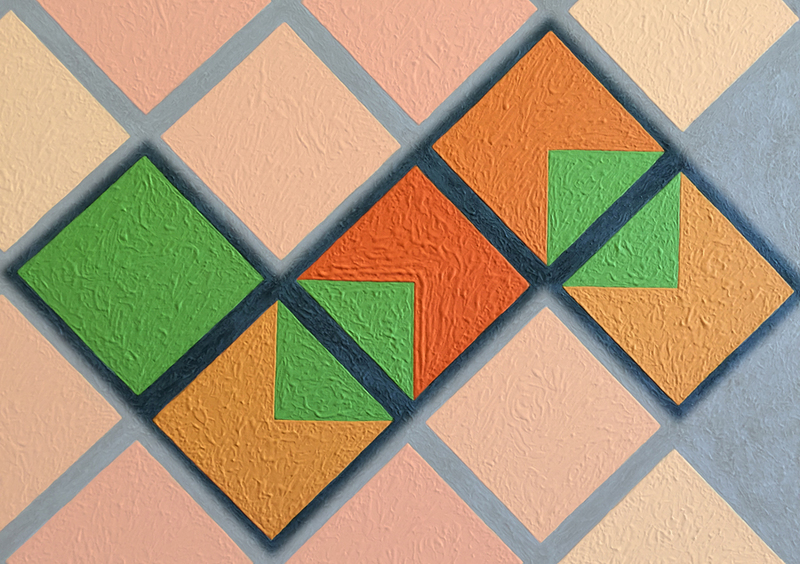 On the other hand, the orange diamond is disturbing the square community by refusing to tilt and take a square position pushing the other squares outside of their natural places. In the end we all have similar shapes but we have the choice of movement to adapt a new environment (Transition). Movement is an individual choice something that we can change while color is a group aspect which represents what we usually can’t change like race ,heritage and history. The square came from a stable environment, it is in harmony with gravity. That aspect gave the squire the confidence to tilt because if it fell from the diamond position it will settle on one side to be a square again. On the other hand the diamond is trying to balance itself against gravity because this is what the diamond is used to, coming from a community that always balancing against gravity doing the same thing (trying to be different). We are obsessed of being different just to feel special. Are we really different if we are doing the same thing? It's not about being different it's about being yourself even if being yourself is not different. Being an individual is about who you are, and not what makes you different from others. 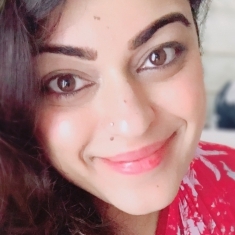 We are diamonds refusing to tilt, we want to feel special even if that causes disturbance .In fact sometime we seek disturbance to be different. The square is participating and adding to the diamond community which is not used to movement, but even the square is gaining more by traveling and migrating .The square is discovering that it has the ability to slice itself, growing and getting to be more than just a square, something that is demanded by the need to communicate. The small triangles make small squares which are the only actual squares outside the square community. It's not about how you look, it's about the trace and the effect that you leave on others .Being a square in the collective awareness of the diamonds community is much stronger than just looking like a square to them. Now the diamonds that got in touch with the square will collect information re-assembling the triangles to squares, diamonds or even other shapes and they have the responsibility to educate the community about the squares culture. Reassembling the triangles to make new shapes is also another way of saying that communication and cultural outreach between nations are the first seeds for innovation. The possibilities of new shapes that will result out of those triangles are almost limitless. There is no line between the squares and the diamonds because in realty what separates us is virtual .In actuality what is really separating us is our ways of thinking. Geography is only separates us physically while the mental separation what makes us as squares or diamonds. So is the migration geographical, or is it between groups regardless of geography, or even internally in each individual, a migration of ideas and concepts. If that is the case, then the small triangles could provide bigger triangles to fill the gaps in the separation area between the two communities. The colors of the two communities symbolizing radicalism and similarity, because the green used to be the radical blue and the orange used to be the radical red and by adding yellow to both of the original colors we have natural and earthly colors that don’t antagonize each other (Rebirth).There is no need for revolutions if we migrate from within. We must embrace our inner renaissance by adding (yellow) to our radicalism and by (tilting) with the situation. The more red or blue in the mix the darker orange or green you get .The different shades of orange or green are working as a metaphor for degrees of radical nature that we have in the mix of our mentality.If we compare a light orange to a dark one it looks almost like yellow. Even in the same community we are discriminating and judging others in comparison to us. Color blind: most color blind people can distinguish between red and blue but they could not do the same with orange and green .This is another metaphor to emphasize that this world of difference depends mostly on how we receive it, and sometimes we can be color blind by choice. The grey color is the neutral space in between, the space of opportunity for other colors to appear. Texture here is a tool to go deeper to the individual level. It gives us an organic surface to remind us that we are actually not talking about squares and diamonds, we are talking about people. Each shape has its own individual print, a swirling fluid surface which symbolizes the ability to react and change individually. 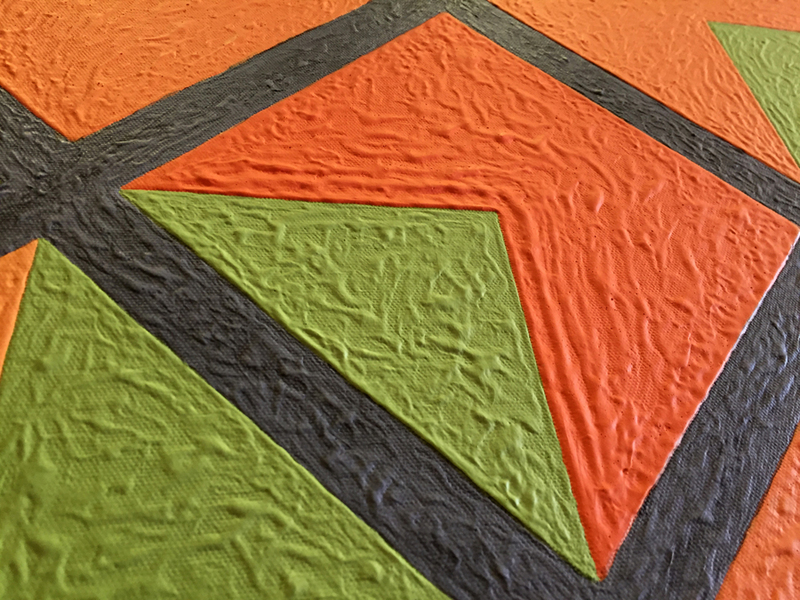 This reaction is very evident in the dark orange diamond in the middle taking the green triangle. 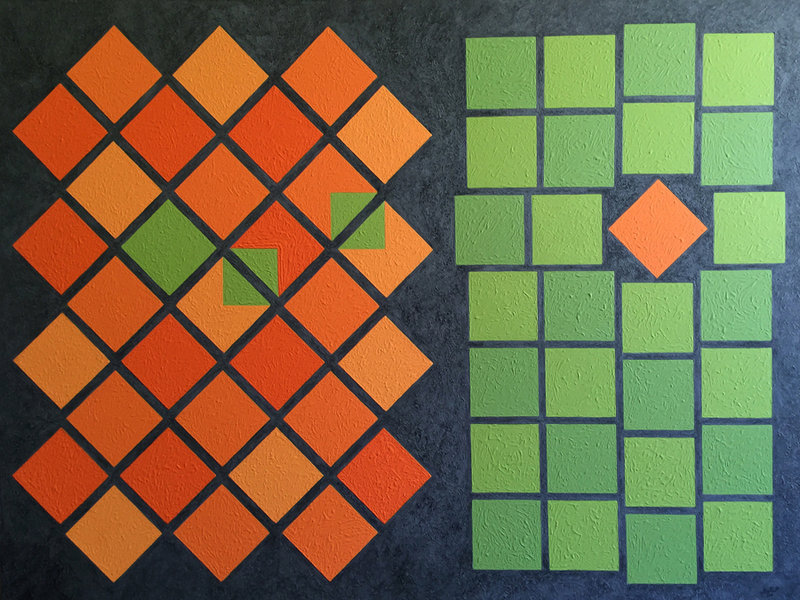 It is harder for people to accept new ideas when they are more radical (darker orange). I consider this diamond is the real hero of the story. Resisting inner radicalism by accepting others even when it's difficult. We can see the triangle is digging and carving deeper inside the diamond core. Innovation and new ideas succeed not only because of the persistence of their maker... New ideas succeed mostly because they found somebody to accept them.. Human history is full of wonderful ideas that never saw the light just because they never found acceptance. This dimension is dealings with time’s change which is the actual migration. Change needs time for communicating ideas and implementing them. All units of time are fixed. Minutes days weeks and years, all consist of a fixed number of smaller units of time. Only months differ in number of days (28 to 31). This symbol used as the difference in number between the two groups of squares and diamonds.